When it comes to maintenance, service or repair work in the haulage industry, it is essential for a haulier to use someone that they not only trust, but know that the work will be done to the highest standard possible. These days more than ever, the importance of having a well-run fleet of trucks and trailers was never more essential as legislation on road worthy vehicles has certainly tightened up. There are many companies that specialise in maintenance and repair work, but few offer the type of service that Munster Truck & Trailer Services provide to their ever expanding customer base. This service was recognised at the Freight & Exports awards this year when the company was named best Independent Workshop of the Year. The award was in recognition of the modern, state of the art workshop that this family run business uses to carry out their daily duties. Based just outside Dungarvan, Co Waterford, Munster Truck & Trailer Services moved into a new garage last January, which is located on the site that they have previously operated from. Of course, the owners Gerard and Tomás Horgan would be well-known in the haulage industry as they operate the long-serving Dungarvan Transport for many years. Gerard spoke to Irish Trucker about the business and he admitted that it was a huge honour to receive an award for the work that they do. “We are delighted and honoured to receive the award. We have no idea who nominated us, but someone came to the premises and inspected it without us knowing,” said Gerard. “We treat every customer the same when they come in, no matter what their query might be and it is always our aim to work closely with our customers and ensure that they know what we are doing at all times. Munster Truck & Trailer Services offer their customers many services for both light and heavy commercial vehicles as well as trailers and other equipment involved in the haulage sector. DOE preparation, tachograph and speed limiter calibration, breakdown and recovery, general maintenance and inspections are all part of the full suite of services on offer. “We specialise in a wide range of services including scheduled service of the customers' vehicle can be done at a time to suit them. We can get them in and out in a couple of hours with a pre-arranged booking and if needed they can wait while we do the job. Full engine reconditioning or rebuilding facilities are available. 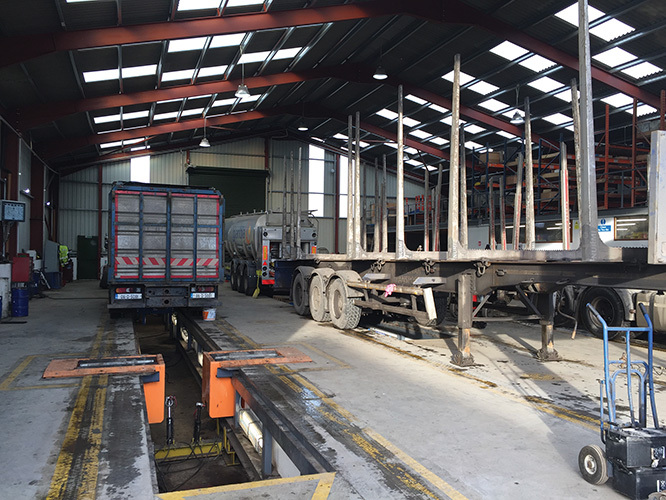 DOE preparation is an area that has taken on greater significance in recent years and the team at Munster Truck & Trailer Services will ensure that the customers' vehicles will be in excellent condition ahead of a test. Munster Truck & Trailer Services has a maintenance contract with Glanbia for the maintenance and repair of milk collection tankers, along with a number of other firms who can attest to the efficient and dependable mechanical repair service they provide. “We were doing our own maintenance work on our trucks and then we got the contract with Glanbia, from there we started to branch out and offer our services to other customers and we have steadily grown from there,” stated Gerard. Munster Truck & Trailer Services offer a friendly and efficient service that sees them price their work accordingly, which always benefits the customer.